Note that this isn't about the most popular animal "characters" in any film genre. This is about the actors who actually play them! Of course, in particular, we adore the work animals do in films, especially when it's horror. And make no mistake: we've got the greats like CUJO, and PET SEMATARY under our belt, the fact is.... The actors who played those iconic roles don't seem to get as much recognition as their human coworkers! It's time to celebrate animals in film. Seriously. Yeah, we get a lot of news about some of the animals playing parts for the longest time, and some may have certain PETA-issues -- but no matter what, animals are integral in the storytelling we see on film -- anywhere, for that matter. So you have to recognize somehow that these famous animal actors know what they're doing and take pride in it. Animals like the dogs playing the iconic character Benji. Or how about Keiko of FREE WILLY fame? Even Crystal the Monkey of X number of films deserves herself a nice Oscar award, and don't even get me started with the infamous and amazing heralded film career and legend of Strongheart, the first German Shepherd to ever star in a movie -- and a nice handful of other films to follow. What About Horror, Though? Why Examine the Horror Genre? Because when you think about it.... It's really hard to get an animal actor to act scary. When they act scary, it's usually a bad thing. Even the good guy animal characters aren't exactly a hot commodity, and we don't know why -- nothing beats watching a badass horror flick about an animal surviving the odds. But guess what: they're out there. And here they are. Bart the Bear -- You can't even imagine the storied career of this bear. Starring in the most amazing films, and you'd think they'd all be about dramas or feel-good movies. Not so. Bart the Bear has been in some scary roles -- like LEGENDS OF THE FALL (yes, not a horror flick, but that fight scene at the end with the bear was truly wicked), and most notably.... THE EDGE with Anthony Hopkins and Alec Baldwin. Even Bart's mother served as the monster role in the iconic film GRIZZLY back in 1976. Yaka and Nepo -- A duo combo right here, playing the same role in the underappreciated horror film ORCA. I found this notable given the hoopla with both JAWS (classic film, yes -- just a fake shark) and, of course, how much attention we gave to Keiko for FREE WILLY (which, honestly, was a truly wonderful film). 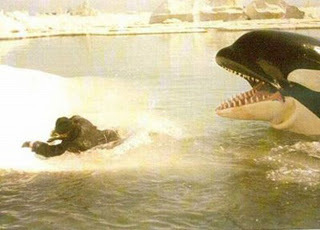 Say what you want about killer whales in captivity.... But I would take these two awesome animal actors any day over an animatronic fake shark. Sully "Steven" Seagull -- Talk about a breakout role, and a complete surprise in cinema. Yes, that one Blake Lively film THE SHALLOWS did feature a real (not fake, or CGI) seagull, sort of like Tom Hank's "Wilson" in CASTAWAY. Only Wilson was a freakin' volleyball. Sully was a seagull sporting a real dislocated wing, which is why that bird was stuck on the rock with Lively for almost the entire film. And, boy, did Sully act his heart out. Everything you saw in the film (sans the snapping the wing back in place, I think) was real. Completely real. And at this moment, it's Sully's only film credit, and arguably the best out there at the moment. Arguably the best films to watch in the horror/thriller genre -- THE EDGE, ORCA, and THE SHALLOWS (which, surprisingly, was quite good). Again, Though, I Don't Discount the Classics at All! I love PET SEMATARY. I love JAWS. I love CUJO. I love all of those monster movies. But as far as the acting side of it.... Nothing beats these three at the moment. I appreciate what goes into the filming of a movie when it requires working with real animals in real situations. And when you're filming a horror movie -- that's a challenge! Bravo to all affiliated with the filming of animals, welcoming that challenge.